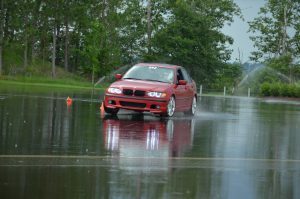 Proving Grounds Auto-X Track / Wet Skid Pad Day at Barber Motorsports Park!!! Come join the BMW CCA Heart of Dixie Chapter for a Fun Day at the Barber Motorsports Park Proving Grounds Track! Do we have great day planed at the Barber Proving Grounds? The answer is YES! We will have a combination of auto-cross and wet skid pad sessions to challenge your driving skills and experience car control like you have never seen. Barber’s Proving Ground is not your normal parking lot auto-cross. This course has everything from high speed banking to nice sweeping switch backs. There will be two courses run during the day, so when you think you have the course figured out, think again, because it will be a whole new challenge! Ever driven on ice? That is exactly what the skid pad feels like. It will be a blast! Your track day will consist of both skid pad and auto-cross sessions. Register early because we have limited slots available. We will be on track from 8:00 AM – 5:00 PM. Registration Fee is $125 per person. Cancellations up to April 27, 2019 will receive a refund less a $35 processing fee. NO CANCELLATIONS / REFUNDS AFTER April 27, 2019.